Securing corporate resources and data in the workplace is everyone s responsibility. Corporate IT security strategies are only as good as the employee s awareness of his or her role in maintaining that strategy. 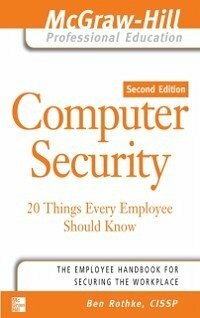 This book presents the risks, responsibilities, and liabilities (known and unknown) of which every employee should be aware, as well as simple protective steps to keep corporate data and systems secure. Inside this easy-to-follow guide, you ll find 20 lessons you can use to ensure that you are doing your part to protect corporate systems and privileged data. The topics covered include: Phishing and spyware Identity theft Workplace access Passwords Viruses and malware Remote access E-mail Web surfing and Internet use Instant messaging Personal firewalls and patches Hand-held devices Data backup Management of sensitive information Social engineering tactics Use of corporate resources Ben Rothke, CISSP, CISM, is a New York City-based senior security consultant with ThruPoint, Inc. He has more than 15 years of industry experi ence in the area of information systems security and privacy. Biography of Ben Rothke Ben Rothke, CISSP is a New York City based senior security consultant with ThruPoint, Inc. and has more than 15 years of industry experience in the area of information systems security. His areas of expertise are in PKI, HIPAA, 21 CFR Part 11, design & implementation of systems security, encryption, firewall configuration & review, cryptography and security policy development. Prior to joining ThruPoint, Ben was with Baltimore Technologies, Ernst & Young, and Citicorp, and has provided security solutions to many Fortune 500 companies. Ben is also the lead mentor in the ThruPoint, Inc. CISSP preparation program, preparing security professionals to take the rigorous CISSP examination. Ben has written numerous articles for such computer periodicals as the Journal of Information Systems Security, PC Week, Network World, Information Security, Secure Computing, Information Security Magazine, Windows NT Magazine, InfoWorld & the Computer Security Institute Journal. Ben writes for Unix Review and Security Management and is a former columnist for Information Security and Solutions Integrator magazine; and also is a frequent speaker at industry conferences. While not busy making corporate America a more secure place, Ben enjoys spending time with his family, and is preparing to run in the 2003 Marine Corps Marathon for the Leukemia & Lymphoma Societys Team In Training, the world's largest endurance sports training program Ben is a Certified Information Systems Security Professional (CISSP) & Certified Confidentiality Officer (CCO), and a member of HTCIA, ISSA, ICSA, IEEE, ASIS & CSI.